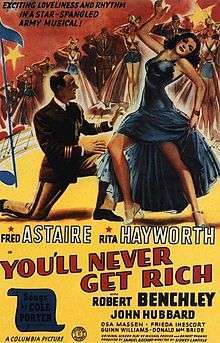 You'll Never Get Rich (Columbia Pictures) is a 1941 Hollywood musical comedy film with a wartime theme starring Fred Astaire, Rita Hayworth, Robert Benchley, Cliff Nazarro, with music and lyrics by Cole Porter. The film was directed by Sidney Lanfield. The title stems from an old Army song which includes lyrics "You'll never get rich / by digging a ditch / you're in the Army now!" This was Hayworth's first starring role in a big budgeted film from her home studio Columbia Pictures. While the film was in production Life Magazine put her on its cover, and featured inside a photo of Hayworth kneeling on a bed in a nightgown, which soon became one of the most widely distributed pin-ups of all time. Hayworth, a talented and sensual dancer of astonishing natural grace and beauty, cooperated enthusiastically with Astaire's intense rehearsal habits, and was later to remark: "I guess the only jewels in my life are the pictures I made with Fred Astaire". The picture was very successful at the box office, turning Hayworth into a major star, and provided a welcome boost to Astaire who felt his career had flagged since breaking with Ginger Rogers. One of the film's songs, Since I Kissed My Baby Goodbye, was nominated for an Academy Award for Best Song. Theater owner and womanizer Martin Cortland (Robert Benchley) enlists the aid of his manager Robert Curtis (Fred Astaire) to woo dancer Sheila Winthrop (Rita Hayworth) but is caught by his long-suffering wife Julia (Frieda Inescort), who hints that he's gone too far this time and his increasingly unbelievable excuses might soon be judged by "twelve strange men." Robert and Sheila are attracted to one another but Robert is caught in Martin's continual attempts to deceive his wife (and keep his marriage, and thus his fortune, intact) and Sheila doubts Robert's sincerity. Captain Tom Barton (John Hubbard), an old friend and potential suitor, invites Sheila and her Aunt Louise (Marjorie Gateson) to visit him and his mother (Ann Shoemaker) on his Army base. Coincidentally, Curtis is drafted into the Army and posted to the same base under the command of The Top Sergeant (Donald McBride), where he quickly befriends fellow draftees Swiv (Cliff Nazarro) and Blain (Guinn 'Big Boy' Williams). Curtis finds himself imprisoned in the guardhouse, where he encounters the visiting Sheila and quickly spins his own web of lies (including a fictitious promotion to Captain) in an attempt to impress her and win her heart. He "borrows" a Captain's uniform and visits her, where he is introduced as Captain Curtis to several other officers, including Barton and the officer whose coat he was wearing. Sheila takes pity on him and allows him a graceful exit. On his return to the guardhouse he finds his friends also confined for aiding him. Martin appears on the base to produce a show for the enlisted men and (at his request) is assigned Curtis as his assistant, who offers Martin the use of his apartment in town and insists that Sheila be included as his partner in the show. However, Martin is now in pursuit of another dancer, Sonya (Osa Massen), and has promised the lead to her. Captain Barton learns that he is being transferred to Panama and asks Sheila to marry him and accompany him there. Alarmed, Curtis races to his apartment to retrieve an engraved diamond bracelet that Martin had purchased for Sheila; unknown to him, Martin had had the bracelet re-engraved for Sonya. Martin sends Sheila to town to bring Robert back before he's declared AWOL. In his apartment Robert is startled to find Sonya, who was staying there at the invitation of Martin. Sheila arrives with the MPs on her heels and helps Robert escape, but encounters Sonya and sees her name engraved on the bracelet. She decides to marry Captain Barton and withdraws from the show. Martin's ever-suspicious wife, invited by Curtis, arrives and Sonya is forced to leave the show as well, which is canceled for want of a leading lady. Curtis' friends hold a demonstration to convince Sheila to return to the show. Curtis arranges for a genuine Justice of the Peace to participate in a wedding scene, resulting in (unknown to her) their actual marriage on stage. Martin confesses his machinations to Sheila, who embraces him in relief and calls on her new husband in the guardhouse. The jilted Captain Barton generously arranges for Curtis' release for his honeymoon; the film ends with Swiv and Blain's inept attempt to break into the guardhouse to free Curtis. 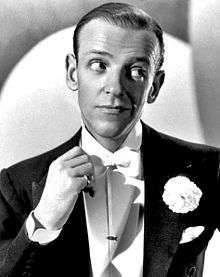 Publicity still with Astaire for film. Dance director was Robert Alton, Astaire's second-most-frequent choreographic collaborator after Hermes Pan. As Astaire generally choreographed his own and his partner's routines, Alton concentrated on the choruses. The choreography explores a diverse range of musical rhythms some of which are artfully juxtaposed in Cole Porter's score. Rehearsal Duet: Short but virtuosic tap number with Astaire and Hayworth dancing side by side. "Boogie Barcarolle": Porter number which, not unlike Robert Russell Bennett's Waltz In Swing Time from Swing Time, overlays two very different musical rhythms. Astaire leads the chorus which includes Hayworth in an exhilarating and, for Astaire, unusual routine. "Shootin' the Works for Uncle Sam": Song and dance number where Astaire and chorus march through a train station. The choreography expresses the notion that Broadway-style dance rehearsals and army camp drills have much in common. The music and dance contrast march and jazz rhythms. "Since I Kissed My Baby Goodbye": Haunting and melancholy Porter standard introduced by the Four Tones - an African-American quartet (lead singer Lucius "Dusty" Brooks, Leon Buck, Rudolph Hunter, and John Porter) - followed by a short Astaire solo, and all executed in the unrealistic - for its time - setting of an unsegregated guard house. Astaire also made a successful recording of this number with Decca in September 1941, backed in this instance by the Delta Rhythm Boys. "March Milastaire (A-Stairable Rag)": Another Porter number contrasting march and jazz rhythms, danced in a "tour de force" tap solo by Astaire, who expresses his sudden joy of being in love by using his taps to make as much noise as possible. This time the purely instrumental African-American backing group comprised the twenty-year-old Chico Hamilton on drums, Buddy Collette (clarinet), Red Mack (trumpet), Alfred Grant (guitar) and Joe Comfort (jug). "So Near and Yet So Far": Porter's rumba melody is set to lyrics (sung by Astaire), which sum up the nature of Hayworth's irresistible allure. Astaire, clearly inspired by Hayworth's exceptional Latin dance pedigree, delivers his first on-screen synthesis of Latin-American and ballroom dance steps in a celebrated romantic partnering. "The Wedding Cake Walk": Liltin' Martha Tilton's rendition of this cheerful song is followed by a routine involving Astaire, Hayworth and a large chorus, the former pair ending up dancing on a wedding cake in the shape of a tank. ↑ "You'll Never Get Rich Preview-". Turner Classic Movies. August 12, 2014. Retrieved August 12, 2014. John Mueller: Astaire Dancing - The Musical Films of Fred Astaire, Knopf 1985, ISBN 0-394-51654-0.